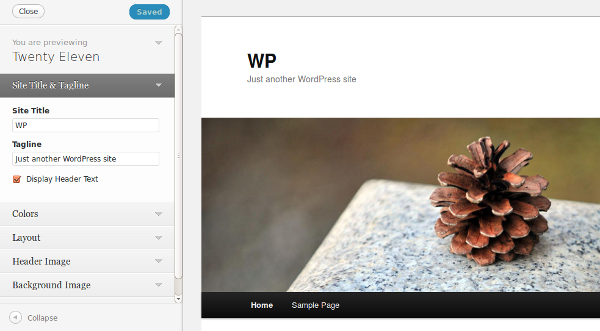 WordPress Version 3.4 introduced Theme Customizer and Version 3.6 directly linked it from Appearance > Customize. Also, the Theme Options Screen has been renamed Customize Screen. 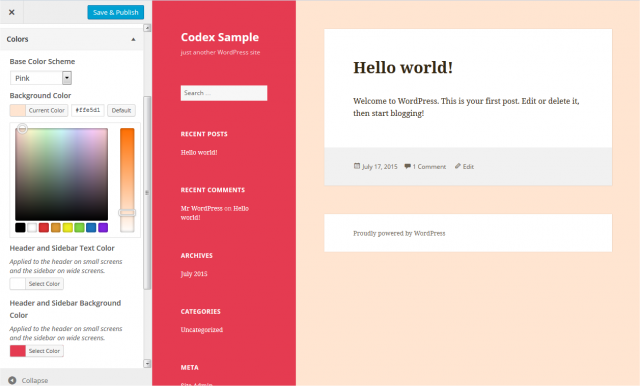 It allows a Theme author to give users the chance to change certain Theme features such as color and layout in a live preview format. Please note, the Customize Screen is only available if the active theme supports a Customize ability. In addition, this screen will likely be different for each Theme that enables and builds it. 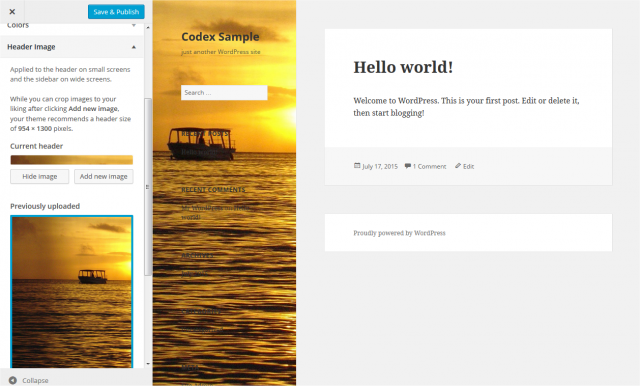 The Customize Screen for WordPress Twenty Fifteen theme, for example, provides options to change the Colors and select a background image. Base Color Scheme - Color Scheme is a color preset for the theme. Choose your favorite color pattern from this dropdown box. You may change each component color after this selection. Background Color - Click the Select color button. You can either enter a hexadecimal number (e.g. d33131) representing the color to be displayed as the background of your theme, or from the color picker, click the desired color and the hexadecimal number for that color will be placed in the Color field, or click Default to restore the initial condition. This background may only be visible on wide displays. Header and Sidebar Text Color - Select text color of the header on small screens and the sidebar on wide screens in the manner as for the above background color. Header and Sidebar Background Color - Select background color of the header and sidebar. Add new image - Click this button to open Choose Image dialog box. You can choose an image that is already in your Media Library, or upload image file from your local computer in Upload Files tab screen. After selecting the header image, click Select and Crop button to go to Crop Image dialog box. The Crop Header Image feature allows you to select an area of an image and then delete all but that selected area. When initially displayed, WordPress shows that maximum sized crop area in a lighter shade. When using a theme such as the WordPress Twenty Fifteen theme the header image is expected to be 954 x 1300 pixels so that is the size of the selected area shown. You can click, hold, and drag the lighter crop selection area and down (or up) the image to the desired point. Also, you can click one of the eight crop resizer boxes (little square box on each corner and each side) to move the crop selection area.